­Thank you for visiting the City of Poetry website. On this site you find details of all the books available - please go to Catalogue for details and click on the image for reviews and purchasing details. The theme of these poems is gold. Gold is understood to be a prime motivation in a metropolis. The poet understands that there is a harsh dividing line between life and the motivation of greed and profit. But human existence in these poems is just above the surface not below it. The A-Z listing is the index to the London city map but the destinations arise for different reasons. The poems can therefore be read in any order, they are all separate journeys, there many starting points, destinations, searches and resolutions. ‘The streets shall be our brushes/ the squares our palettes’. This is a quotation from the Russian poet Vladimir Mayakovsky (Marshall, H (1933/4) Mayakovsky and His Poetry Chiswick, London, Pilot Press). In a development of this imagery, the buildings are our form and the broken sentence structures our disconnected sense of time under pressure. The form of these poems looks familiar – stanzas, regular syllabic lines, left margin justification. The sentence structure is fluid leaving the reader needing to double read the lines backwards and forwards so that the full meanings emerge. The poem structures reflect the city structure, its buildings, bridges and streets. The fluid sentences reflect the double-takes that city dwellers perform every day, every hour in order to juggle and make sense of events within the combination of time and memory in city life. The frequent pronouns ‘I’ and ‘you’ are not counterbalanced by ‘they’ and ‘them’. These poems are a personal dialogue with a strong sense of engagement. How does city poetry use the metaphoric or metonymic forms? The metaphoric is expressed through a combined ideation – one thing is another. The metonymic is expressed through a contiguous or sequential ideation (see Roman Jakobson) – one this as another, or as well as another. If the city is gold then this is a metaphor, if it is as gold then this is a metonym. If the poem is saying – this city is as gold but it is ice gold – then ‘Ice Gold’ (see the poems) is a metaphor within a metonymic relationship. 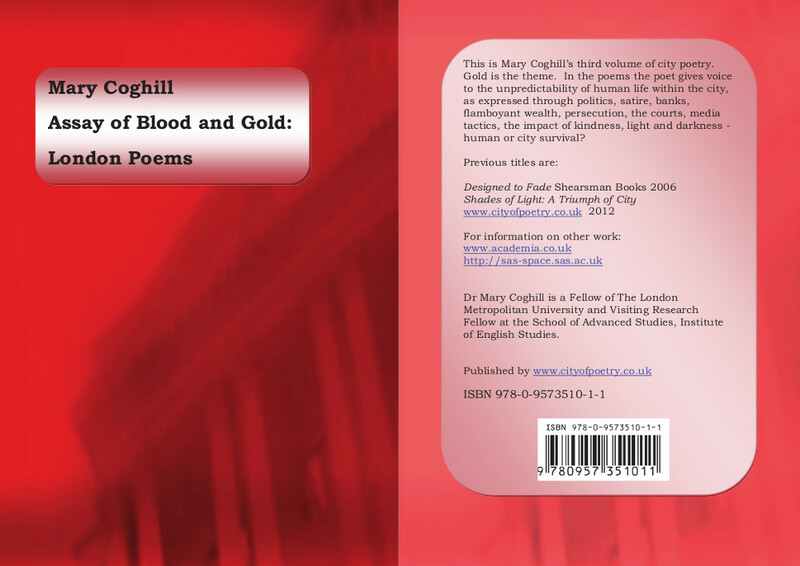 ‘Blood’ is metonymic, it stands as part for whole – ‘blood’ represents the human body. As such it is a synechdochic metonym. But if life in the city is bloody, even fatal (see the poems) then this is neither metonymic nor metaphoric it is literal. The city, the assay – the assault, the trial of mettle – and the blood are real.